Unpowdered latex gloves that are thicker than typical latex gloves for enhanced protection, and also provide the greatest protection where you need it - at the fingertips - to prevent ripping and tearing. Polyethylene wrist-length gloves are the popular disposable glove of choice for the canine collection industry. 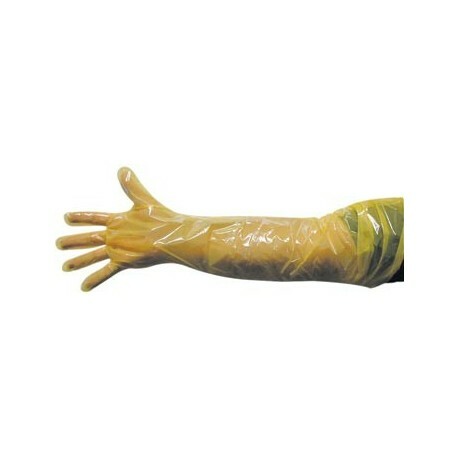 These are clear 'plastic bag-style' glove. Great as a one-time use glove for multiple applications. Up to your elbows in work? Well then, here are the gloves for you! These polyethylene gloves have durable seams and reach to the average person's elbow. Same basic design as the polyethylene wrist gloves, but with extra length. 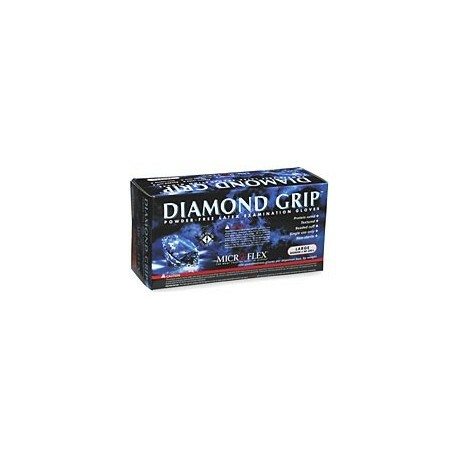 A durable glove with great maneuverability characteristics. Packaged 100 gloves per handy dispenser box. Ambidextrous. Shoulder length gloves are the most popular in both the cattle and horse industries. 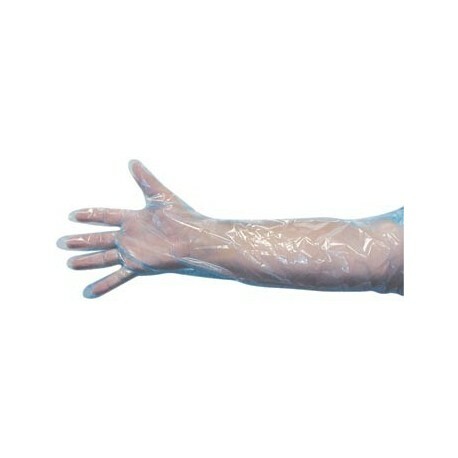 Standard shoulder length clear polyethylene glove. These 34-inch-long gloves are packaged 100 per dispenser box. 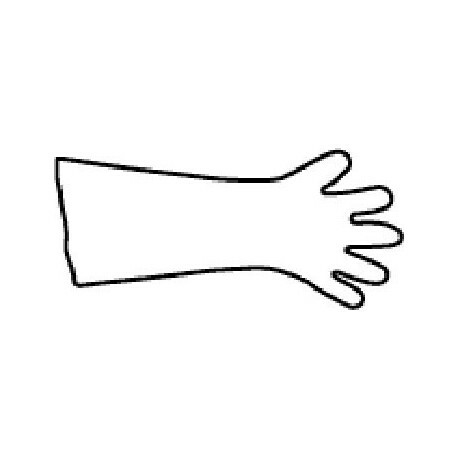 All are ambidextrous with a 45 degree angle thumb. 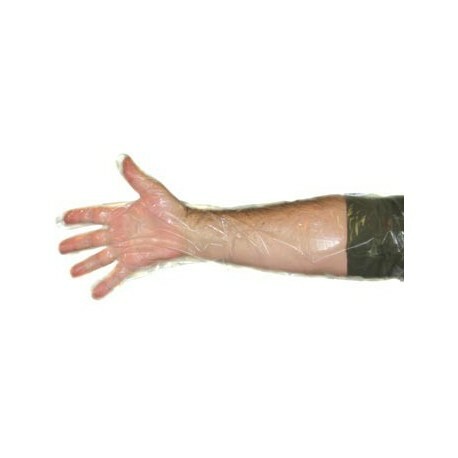 NON LATEX Fits either hand. Disposable. Low powder. Much more puncture resistant and durable than latex, cooler than rubber.100 per box. Brands will vary. Shoulder length gloves are the most popular in both the cattle and horse industries. These gloves are sturdy disposable vet gloves with a 90 degree thumb, designed for the smaller hand. This is a Supersensitive glove that is folded, individually wrapped and sterilized. Shoulder length gloves are the most popular in both the cattle and horse industries. Designed for standard to large-sized hands. They are a durable glove with a 90 degree thumb angle. This 1 mil blue soft vet glove is individually folded, wrapped and sterilized. Shoulder length gloves are the most popular in both the cattle and horse industries. Designed for standard to large-sized hands. They are a durable glove with a 90 degree thumb angle. This 1 mil yellow glove is very sensitive. Individually folded, wrapped, and sterilized. Shoulder length gloves are the most popular in both the cattle and horse industries. A 1mil blue soft vet glove designed for standard to large-sized hands. They are a durable glove with a 90 degree thumb angle. 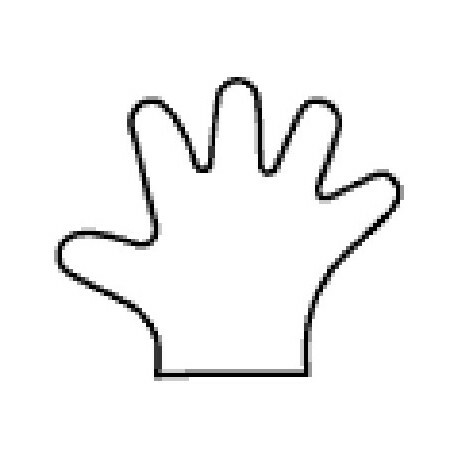 Also available in regular or Supersensitive™, all are ambidextrous.